When asked to list my favorite guitarists, I often receive a few baffled looks from those expecting a list of Axe-Slinging Super Shredders. 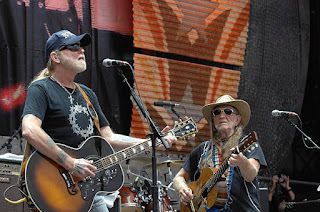 Sure, usual suspects like Dickey Betts, Duane Allman, Derek Trucks are at the top, along with the legendary blues powerhouse Albert King, but right up there is the Red Headed Stranger himself: Willie Nelson. But how can I possibly prefer Willie Nelson as a guitarist over the likes of Clapton or Hendrix? Well, it's not all about guitar pyrotechnics and I can listen to Willie pick his famous busted up nylon-stringed Trigger all day. After years of writing country music standards like "Crazy" and "Hello Walls" for other artists, Nelson became a country music hero in the 1970s by stripping the strings and slick arrangements that dominated sequined Nashville tunes of the day. Nelson's rustic approach (and rugged appearance) gave his country music an authenticity that was missing from the Charlie Riches and Conway Twittys of the mid-1970s. Along with fellow industry rebels like Waylon Jennings and Kris Kristofferson, Nelson helped created a sub-genre of its own: Outlaw Country. People who couldn't stomach Tammy Wynette and George Jones singing about domestic discord could totally get on board Willie Nelson's fresh, rootsy approach to country music. But even among his Outlaw brethren, Willie Nelson's music was tonally different. Nelson's music was often somber, compared to the sweaty, coke-fueled vamping of Jennings' barrel house shows, or even the Hollywood-produced music of fellow "Outlaw" Johnny Cash at the time (he had his own TV show). 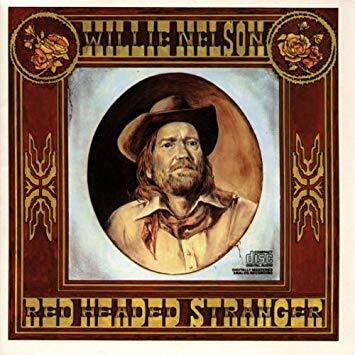 1975's Red Headed Stranger was a melancholy concept album that put Nelson's creaky, pained voice that was never slick enough to break into the Nashville mainstream on full naked display. Along with a delicate jazz guitar approach, far removed from the telecasters of James Burton and the Gibson Doves of Hee-Haw, made this music universal by crossing genres (Nelson released an album of jazz standard covers, Stardust, shortly after Stranger). Red Headed Stranger was as lonesome as a Hank Williams tune, with the rawness of Jimmy Rodgers or the Carter Family, minus the twang and yodeling that had become a Nashville cliche. So I picked "Blue Eyes Crying in the Rain", a song written in 1947 by Fred Rose and covered by a number of artists such as Roy Acuff, Hank Williams, and Charlie Pride. You'd be forgiven for thinking Willie Nelson himself wrote it, the song has all of his hallmarks and was heavily featured in the movie adaptation of Red Headed Stranger a decade later. The arrangement is bare, and although Nelson's voice relates the despair truthfully, it's Trigger that caries the tune. It's often more difficult to perform a song with less, a stripped down tune is on full display. That's why the simple dobro part I included took me a while to arrange. It's a song that deserves to breath, and tough to approach when Willie did it so perfectly.